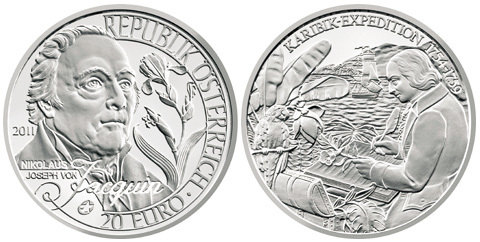 The Mint of Austria have issued (23rd February) a new silver coin to mark the natural science expedition led by Nikolaus Joseph von Jacquin (1727-1817) who headed his team into the Caribbean and visited various islands such as St. Vincent, Grenada, Aruba, St. Christopher, Haiti, Jamaica and Cuba between 1754 and 1759. Born in Holland, von Jacquin moved to Vienna in 1727 and was commissioned by the Austrian Emperor Franz (husband of Empress Maria Theresa). Nikolaus Joseph von Jacquin also took his expedition to the coastal regions of the South American coasts (what is Venezuela and Colombia today) and sent back many collections of plants, animal and native artifacts to Vienna for further study. The obverse of the coin features a portrait of von Jacquin along with the plant iris variegata, one of his discoveries. The reverse shows him at work cataloging his botanical discoveries in the Caribbean. The coin is part of the EUROPA silver star international program whose theme this year is European explorers. The distinctive star logo is included on the coin’s obverse just under the portrait, along with the coin’s year of issue 2011. Each coin has a nominal value of 20 EURO and is struck in .900 silver with a weight of 20 grams and a diameter of 34 mm. The coins will be issued in proof quality with a mintage of 50,000 pieces.